The Dead Sea Scrolls Translated: The Qumran Texts in English. Edited by Florentino García Martínez. Translated by Wilfred G. E. Watson. Second edition. Leiden: E. J. Brill; Grand Rapids: Eerdmans, 1996, 519pp., $30.00 paper. 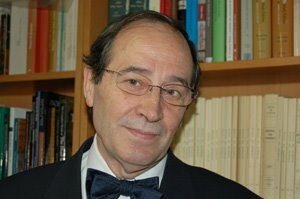 Florentino García Martínez is a member of the international team of scholars working on the Dead Sea Scrolls and heads the Qumran Institute at the University of Groningen in the Netherlands. He has authored numerous books and articles on subjects related to the Scrolls and serves as editorial secretary for Revue de Qumran. As his credentials reveal, he is uniquely qualified to pull together a volume such as this. The first edition appeared in Spanish under the title Textos de Qumrán. E. J. Brill published the first English edition translated by Wilfred G. E. Watson and has agreed to joint publication with William Eerdmans Publishing Company. Others have published English translations of the scrolls, e.g., Geza Vermes, The Dead Sea Scrolls in English (Penguin, 1987); Theodor Gaster, The Dead Sea Scriptures (Doubleday, 1976); Robert Eisenman and Michael Wise, The Dead Sea Scrolls Uncovered (Penguin, 1992). Though valuable, these books do not contain the number of manuscripts which this volume makes available. As advertised, García Martínez has provided the most comprehensive one-volume English edition of the Dead Sea Scrolls on the market. Scholars believe the eleven Qumran caves have yielded between 800 and 850 documents. Of these 225 or so are biblical manuscripts. Another 275 to 300 are too brief and fragmentary to warrant inclusion in a volume like this. So García Martínez has published about 200 of the most important non-biblical manuscripts so that interested readers, without any knowledge of Greek, Hebrew or Aramaic, can appreciate the riches of this vast collection of Jewish literature dating from the late Second Temple period. He offers the reader a literal, neutral translation of the Scrolls and admits he is hesitant to reconstruct the text in lacunae except when parallel passages or formulas render the conjecture nearly certain. Since he does insist on a such a literal translation, at points the English does not flow well and readers may be left uncertain as to the meaning of the texts. For ease of reading some may continue to prefer Geza Vermes’ The Dead Sea Scrolls in English, but for serious study of the texts García Martínez’s labors provide the greatest fruit. García Martínez begins the book with an “Introduction” which details the history of the manuscript discoveries and publications. He provides a brief and sober account of the intrigue which has surrounded the Scrolls since their initial discoveries. He covers matters relating to the excavation of Khirbet Qumran and concludes the Scrolls were copied and preserved by the sectarians who inhabited this desert settlement. He is a proponent of the “Groningen hypothesis,” namely, that the sectarians should not be simply equated with Essenes. He theorizes that the Qumran community originated in a split among Palestinian Essenes over matters relating to the calendar, feasts, purity laws, worship, temple practices, among other things. Led by the Teacher of Righteousness, the community which deposited the Dead Sea Scrolls withdrew to the desert to prepare for God’s eschatological visitation. García Martínez classifies the scrolls into nine chapters: (1) “Rules,” including the Rule of the Community and the Damascus Document; (2) “Halakhic Texts,” including 4QMMT and various purification rules; (3) “Literature with Eschatological Content,” including the War Scroll, 4QFlorilegium, 4QTestimonia and 11QMelchizedek; (4) “Exegetical Literature,” including the Temple Scroll and commentaries (pesharim) on OT books like Isaiah, Hosea, Habakkuk and Psalms; (5) “Para-biblical Literature,” including the Genesis Apocryphon, Books of Enoch and the Book of Jubilees; (6) “Poetic Texts,” including the Thanksgiving Scroll and various wisdom poems; (7) “Liturgical Texts,” including prayers, hymns, blessings and curses, and Songs of the Sabbath Sacrifice; (8) “Astronomical Texts, Calendars and Horoscopes;” and (9) “The Copper Scroll.” The book concludes with an extensive bibliographic appendix of biblical and non-biblical manuscripts from Qumran. By-in-large the chapter divisions make good organizational sense, and readers will find them helpful. With the release of many documents previously monopolized by the small, elite Scroll team, specialists and non-specialists have rediscovered what W. F. Albright called the greatest archaeological discovery of the twentieth century. García Martínez has labored extensively and expertly to provide what is destined to become the standard textbook of primary resources of Qumran’s non-biblical collection. For those who teach and those who want to study the Dead Sea Scrolls in translation García Martínez deserves our gratitude.